My family on my mom’s 71st birthday last year. 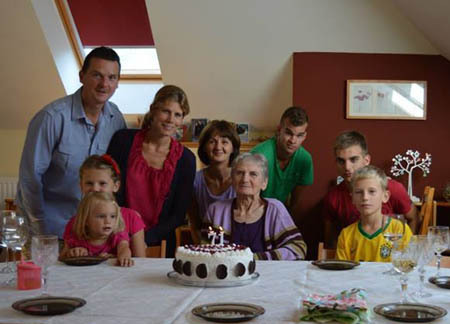 This August we will celebrate the 20th anniversary of her successful kidney transplantation! I consider myself a very fortunate person. During my life so far, I have received many of God’s blessings: parents who gave me important guidance, principles, and determination; congenial professors and people who provided me with the right models, knowledge, and wisdom; and a wonderful, loving, and supportive family. For some people, it is quite difficult to choose their place and career in life. For me, it was clear from the very beginning, and it came from deep down, from my roots. My birth was a miraculous gift to a mother who has suffered from kidney disease since her twenties. With enormous strength and faith, she managed to carry on for over 30 years before entering the end stage of renal disease. She persisted through many critical health crises and remained the perfect mother and center of our family. I was there for her as a little boy, baking and bringing her cookies when visiting her in the many hospitals. Later on, as a young medical doctor, I was able to be there, holding her hand, when she received her first hemodialysis treatment, when she had a cardiac arrest and grand seizures, and for her kidney transplant. For me, she was and always will be the perfect model of courage, dedication, strength, and—in general—the ultimate example of a human being. It may come as no surprise that I chose to dedicate my professional life to studying the kidney and to finding a cure for chronic kidney disease. But even if that sounds simple and clear, my road wasn’t always predictable. For some reason, I am always attracted to the unbeaten path, independence, new things, the discovery of the unknown. As a little boy, I examined blood samples under a microscope, collecting from frogs, chickens, and rabbits. At age 10, I first drew blood from the ear vein of our rabbits with real needles and syringes. Needless to say, I wanted to become a kidney doctor to save my mom. After high school, against all advice, I went far away to the Semmelweis University Medical School in Budapest. The thought of living in the capital city of Hungary worked like a magnet, as I had been raised in a small country village. As a freshman, I was chock-full of energy and courage and, naturally, wanted to save the world. Throughout my university years, to become independent both financially and intellectually, I worked the graveyard shift as a nurse at the Department of Surgery and Transplantation. The pay was not much, but I wanted to know all the details of kidney transplantation—the only way to save my mother. It was no surprise, either, that I found Dr. Laszlo Rosivall, my professor in renal pathophysiology. Dr. Rosivall, a world-renowned kidney expert, was a young, charismatic professor whose mission was to foster high-quality renal research and clinical nephrology in Hungary. He was the first major influence in my scientific career, as he gave me the opportunity to work in his renal physiology laboratory. Although I was preparing to become a transplant surgeon, somehow I felt the pull toward science. As a member of the Students Science Group, I studied animal models of chronic renal failure and learned the basics of renal physiology techniques in Dr. Rosivall’s laboratory for three years. It took me another three years to realize that science, rather than clinical practice, was what I was destined to do. I threw myself into clinical practice; sometimes I was on call for 48 hours in the emergency room, or assisting kidney transplantations in the operating room, while still working as a night-time nurse and part-time scientist. Slowly but surely, I realized the real reason I had the drive to perfect my clinical skills was to help my mother. Otherwise, I found the profession of a physician routine. I chose science because I wanted a professional life that would bring me something new every day, keeping my mind active—one that, if successful, could be more effective at saving lives than my solo clinical practice. Next at Semmelweis, I enrolled as Dr. Rosivall’s Ph.D. graduate student. In spite of the poor economy that put Hungarian science in a difficult position, I managed to publish in top scientific journals like the American Journal of Physiology. I gained significant skills and knowledge in studying renal hemodynamics, glomerular filtration, and the renin-angiotensin system. It was here that I first became fascinated by the importance of these key renal processes in health and disease, and particularly by the anatomical basis of all—i.e., the juxtaglomerular apparatus (JGA). This small and very inaccessible cell complex, consisting of many dissimilar cells that communicate with each other, is a key regulator of renal blood flow and glomerular filtration, renal salt and water conservation, and blood pressure maintenance. The JGA became my primary research interest because of the important role it plays not only in health but in disease processes (hypertension, diabetic nephropathy, acute and chronic renal failure, glomerulosclerosis, etc.). I graduated after three years. Again, I aimed for more than to become just another poorly supported renal pathophysiologist in Hungary, even if the training at Semmelweis was first-rate. I wanted to be world-class. With my interest in the function of the JGA—as I call it, “the brain of the kidney”—choosing where to do my postdoctoral training was not too difficult. I arrived in the United States at the Nephrology Research and Training Center at the University of Alabama at Birmingham, where Dr. Rosivall had earlier received his training. My original plan was to spend two years there before going back to Hungary to continue working with Dr. Rosivall. While at UAB, we made a number of important observations that have provided new insights into the functional characteristics of the JGA, and particularly one of its constituent cell types, the so-called macula densa cells. These are sensor cells in the distal part of the renal tubular network that can detect changes in the composition of tubular fluid and send signals to adjacent cells to control their function. During the amazing seven years I spent with Darwin, macula densa (MD) cells became one of my favorite cell types because of their unique localization, appearance, and multiple functions, many of which are still a mystery. I have always been motivated to learn new techniques that can enhance the technical capabilities of our laboratory. One technique I learned that had a huge impact on my research activities for the following years was multi-photon fluorescence imaging. I was studying the role of cell volume in MD cell function when a world-renowned expert of cell volume regulation, Dr. Okada, happened to be visiting UAB. By chance, I briefly asked him about a small technical issue, and he ended up inviting me to his lab to apply the optimal technique for MD and JGA research—two-photon excitation fluorescence imaging. I was able to master this technique under his supervision at the National Institute for Physiological Sciences, in Okazaki, Japan. Dr. Okada had one of the very first models of this state-of-the-art microscope, and I was eager to combine this novel imaging method with the in-vitro microperfused JGA technique I had learned at UAB. I believe imaging is the only way to study cell-to-cell signaling with high temporal and spatial resolution in the highly complex and inaccessible structure of JGA in living tissue. Over the past 11 years, my lab at USC has pioneered the application of multi-photon imaging technology in studies of the intact, living kidney. We have trained more than 30 investigators from around the world on the use of intravital imaging of the mouse kidney. Our recent imaging studies have addressed and solved a critical technical barrier in kidney research, allowing researchers for the first time to quantitatively visualize the function of the cellular and molecular elements of the kidney filter (glomerulus) in vivo, to examine their roles in the development of disease. Most recently, our laboratory deployed serial multiphoton microscopy to track the fate and function of individual cells in a region of the living intact kidney over several days during disease development. This approach has led to significant advances in understanding the highly dynamic kidney-tissue and glomerular environment, and the mechanisms of glomerular injury and regeneration. Ongoing work in the laboratory is studying the fate and function of renal stem cells and their role in endogenous kidney repair. Based on targeting the molecular mechanisms that control a newly discovered tissue repair process, we are currently developing a new regenerative therapeutic approach for the treatment of chronic kidney diseases. Perhaps my most important accomplishments in recent years, with my wife Reka, are our three wonderful children, Bence, Anna, and Lilla, all born here in Los Angeles after I joined USC. I feel it is my turn to raise and teach the next generation with the kind of courage, dedication, and strength my mother had. I feel very fortunate to be at USC and to be associated with the University Kidney Research Organization (UKRO). All the wonderful people at UKRO, board members and staff, have personal reasons for supporting kidney research, just as I do. It is my great honor to be involved in the efforts of this organization. Given my life experience and the scientific, medical, and research accomplishments and current efforts detailed above, I am prepared and eager to help UKRO accomplish its ultimate mission—finding a cure for kidney disease.